Traditional sequence comparison by alignment applies a mutation model comprising two events, substitutions and indels (insertions or deletions) of single positions (SI). However, modern genetic analysis knows a variety of more complex mutation events (e.g., duplications, excisions and rearrangements), especially regarding DNA. With the ever more DNA sequence data becoming available, the need to accurately compare sequences which have clearly undergone more complicated types of mutational processes is becoming critical. Herein we introduce a new model, where in total four mutational events are considered: excision and duplication of tandem repeats, as well as substitutions and indels of single positions (EDSI). 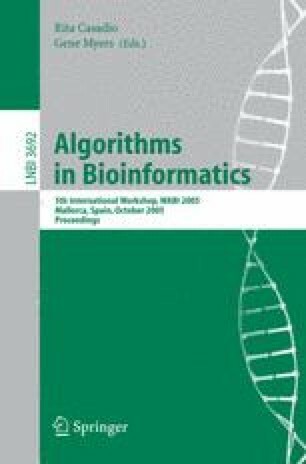 Assuming the EDSI model, we develop a new algorithm for pairwisely aligning and comparing DNA sequences containing tandem repeats. To evaluate our method, we apply it to the spa VNTR (variable number of tandem repeats) of Staphylococcus aureus, a bacterium of great medical importance.